Sesbania sesban | Infonet Biovision Home. Geographical Distribution of Sesbania sesban in Africa (red marked), source ICRAF. Updated on 27th March 2019. This tree has a great potential for soil improvement on small farms due to nitrogen fixation and leaf mulch. A deciduous, short-lived shrub or tree to 8 m.
Bark: Red-brown, young shoots hairy. Leaves: Compound to 12 cm long, 12 - 25 pairs of leaflets, each leaflet to 2 cm oblong, tip notched, narrow. Flowers: Pale yellow, speckled maroon, in few-flowered sprays to 15 cm long. Fruit: Abundant bunches of think pale brown pods to 20 cm, with separated sections so seeds rattle within. Firewood, poles, medicine (ground leaves), fodder (leaves), shade (young coffee), mulch, nitrogen fixation, soil improvement, soil conservation, fibres (young stems), soap (leaves). Propagation may be done by direct sowing at site or wilding. 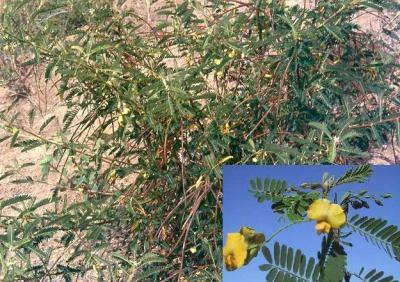 One of the major advantages of sesbania over other forage trees and shrubs is its fast early growth rate, which can be exploited by intercropping it with other slower establishing species for earlier yields. 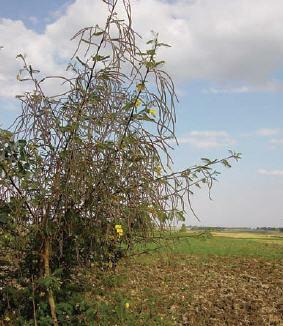 This tree species has been reported to attain a height of 4-5 m in 6 months. It also does well under repeated cuttings and coppices readily, with many branches arising from the main stem below cutting height. 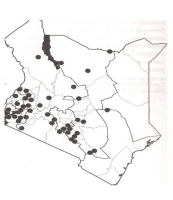 Cutting frequencies are generally 3-4 cuts per year, but up to 8 cuts are made in some areas. Yields also vary from 4 to 12 t/ha dry matter per year, depending on location of cultivation. Cutting height can also determine yield, with cutting heights of 50-76 cm being good for plant survival and productivity. Food: Flowers of this tree are edible and are included perhaps as a decorative or festive ingredient in foods such as the omelettes. Fuel: This tree is popular for firewood and charcoal because it has a high woody biomass, which, although soft, is relatively smokeless, quick kindling and hot burning. Fibre: it is used for making ropes and fishnet and has potential for pulpwood production. Soap: its leaves can be used in soap making. Gum or resin: Seeds and bark produce gum which can be economically exploited. Poison: Saponin, stigmasta-galactopyranoside, which can be isolated from the seeds, has glucuronide derivatives of oleanolic acid, which has molluscicidal activity against Biophalaria glabrata, one of the known snail vectors of schistosomiasis. Medicine: Fresh roots and leaves are used to treat scorpion stings, boils and abscesses. The decoctions of leaves can be used as a drench for cattle to repel tsetse fly. It is also used to treat sore throat, gonorrhoea, syphilis, spasmodic fits in children and jaundice during pregnancy among some communities. The leaves can also be used in some countries as a tea and are considered to have antibiotic, antihelmintic, antitumour and contraceptive properties. Oil from the seeds is accorded special properties too. Shade or shelter: It has been used to shade coffee, tea and cocoa. It has also been used as a windbreak for bananas, citrus and coffee preventing them from destruction. Soil fertility: It can increase soil nitrogen through symbiotic interaction with bacteria; has the ability to stabilize soil, and in some parts it has been used as green manure for rice. The branches have been used as mulch and leaves as a green manure. Intercropping: It is a promising shrub for alley cropping because is established easily, it grows rapidly, coppices readily and provides mulch of high nutrient content. In some climates, such as in the Kenyan highlands, it may have a sparse canopy, and weed competition can be a problem. This characteristic makes it a good intercrop. Shade: the tree provides shade to both livestock and humans in hot weather. Boundary or barrier or support: It can be suitable for use as live trellises for pepper. The species is a prolific seeder with a high germination rate. About 110'000 seed per kg. Germination about 80%. Not necessary for fresh seed, soak stored seed in cold or tepid water for 24 hours before sowing. Seed can be stored for long periods if kept in a cool and dry place, but best germination from fresh seed. The species may harbour root-knot nematodes. 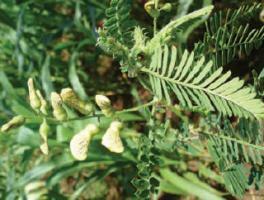 The genetic diversity of Sesbania types allows for selection (e.g. for different uses, management, soil types). The leaf mulch and nitrogen-fixation features make this a tree of great potential for intercropping and thereby soil improvement on small farms. It is susceptible to attacks by nematode, insect, fungi and virus. The leaf-eating beetle Mesoplatys ochroptera can completely defoliate this tree killing it. It can also be attacked by caterpillars, hymenoptera, and stem borers. Some potentially destructive root-knot nematodes have also been recorded as associated with this tree. Due to their ability to harbor root knot nematodes, they should be avoided in combination with crops that are very sensitive to nematodes like banana & Irish potatoes.